This is a very very very very little tool. 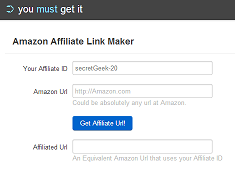 You give it your Amazon affiliate id, and any Amazon url for a product, and it gives you back a url for that product, with your affiliate id. There used to be a lot of neat little tools like this around the place, in the days when people controlled the branding of their own blogs (one bazillion years ago), but I could no longer find one I liked, so I built this one. It uses code that is a part of You Must Get It. If you are signed in to You Must Get It, then it will enter your affiliate id for you. There's also a version for bulk conversion of urls. Combine this with NimbleText and you have a way to turn plain lists of amazon urls into large swathes of affiliated html. If that's your thing.